HUNTING FOR UNHEATED UNPROCESSED NATURAL YELLOW AND BLUE SAPPHIRE CRYSTALS FOR FACETTING. Sun: Ruby, used by royalty to focus and sustain their ability to command and rule. It sustains our vitality and will. Traits that it enhances are leadership, independence, purity. Weakness or afflictions are sometimes demonstrated by a sense of helplessness, but very often it shows up as an unreasonableness, egotism or self absorption, which is a sign of a weak sense of self. A weak planetary ruler of the ascendant (see Rahu, below) can also cause these symptoms, and a weak Mars can cause similar problems as well, which is why they must also be looked at astrologically. The ruby, unless in a balanced multi-gem bangle, should be used with care by Pisces, Gemini and Libra Ascendants, and with companion gems, for every ascendant. Ruby is generally good for Leo, Aries and Sagittarius Ascendants. The ruby illustrates another unorthodox approach that I have developed over the years. Many Vedic astrologers, because they are not trained gemologists, have an erroneous viewpoint about the catagorizing of "synthetic" stones. It is imperative that the reader understand that what I use and recommend are laboratory-grown crystals. These lab-grown gems (also called created gems) are not to be confused with common synthetics. Synthetic stones for the most part, are materials similar in color or chemical composition to the natural, but have no synonymous crystal structure, and by application, no remedial power. Many synthetic gems are often misrepresented as having been grown as crystals in a laboratory. Retailers very commonly appear to not be completely accurate in this regard. A large laboratory-grown crystal can be grown from a smaller natural crystal. Is this any more unnatural than a seed grown in a greenhouse? Though I sell natural (and expensive) rubies and emeralds, my client feedback reveals that much more benefit is gained by those who wear lab-grown gem quality crystal material. The reason being, a deep green laboratory grown emerald is 1/40th the price of natural emeralds and because of budget limitations, clients invariably purchase a much more included and less intensely green natural gem. The laboratory crystals of today grow using the same laws of nature that are activated when natural crystals are grown in magma or other thermal strata (the way natural gems originate). Actually, gems growing near the magma layers do not usually take hundreds of years to form, contrary to the romanticized view of the jewelry industry which hopes to profit from the supposed rarity of gems. These crystals sometimes grow at the same rate as lab-grown crystal gems (2-12 months). For any crystal to have the correct geometric resonating signature, it is essential that the billions of atoms that constitute its atomic lattice line up exactly like its natural counterpart. When this occurs, the major difference between the two is that the laboratory crystal, because it was formed in a controlled, non-disturbance prone environment, has fewer inclusions, color zones, pressure fractures or other flaws. Therefore, the gemological crystal structure and atomic matrix of the lab-grown crystals are in much more perfect symmetrical harmony. Incidentally, the viability and power of laboratory-grown crystals was amply demonstrated with the crystal radio when the original natural quartz crystals were replaced by created crystals, vastly improving receptivity and transmission. In the case of rubies, many gemologists simply do not have the education or the very expensive high-tech equipment necessary to evaluate whether or not certain cultures of lab-grown faceted ruby are of natural origin. Very often if the ruby is flawless, the diagnosis by a gemologist is mistaken. Naturally, professional gemologists do not advertise their difficulty in dealing with this, as it undermines their years of dedicated research (and their reputations). Fortunately, this problem does not apply to synthetic rubies grown by the Verneuil, Czochralski, and Scullcap methods. These are easy to recognize with the correct equipment and make up 99.5% of all synthetic gem material manufactured. This is because created crystals need to maintain extremely high temperatures for months at a time to develop, making the energy costs very high. 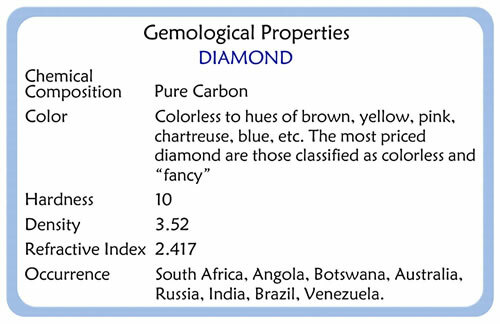 Interestingly, these high energy costs outweigh the commercial logic of growing the less expensive yellow and blue sapphires. For the purist who cannot be convinced of the lab-grown crystal's similarity, please analyze the scientific analysis comparison charts. With regard to measured variations in the charts, it should be pointed out that nature does exactly the same thing with its emeralds and rubies from different fields around the world. I often visit international gem trade shows not to buy material but to keep up with the many different processes of gemstone enhancement. It is critical to have this knowledge that most academically trained gemologists are not kept up to date with . Often the indicative inclusions of gemstones allude to many different types of artificial enhancement. And as new gem fields are discovered or exhausted the latest artificial enhancement techniques will vary widely and require the latest up to date information. This information is generally available from only a few honest gem enhancement technicians who will answer in detail what they do . It is not generally available in the latest gemological publications. Most wholesale gem dealers prefer not to know too much about the details of these many processes so they can plead uninformed and thereby not lie about their stones and lose the consequent sale!! Most gem dealers also do not care if a stone is enhanced as this is a concern of only a very small percentage of buyers who specialise in locating untreated natural gemstones. 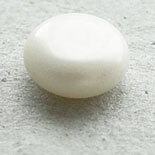 Which are generally much more rare and much more expensive than the great majority of gemstones on offer. This will occur with chemical composition and subtle variations in other measurable aspects such as refractive index, e.g. rubies from Australia are quite different than those from Burma or Vietnam. 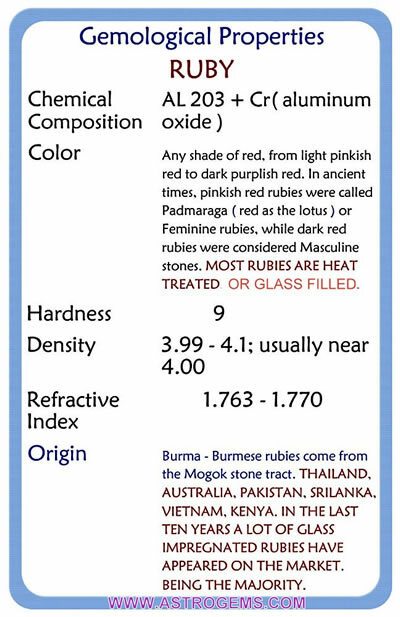 Scrupulously grown laboratory rubies will not only have the same appearance as a flawless natural ruby (with the expected variations that occur in natural rubies from different parts of the world) but, more importantly for our purpose, appear to have the same astrological power to mitigate and nullify planetary influences on our karma - at a decidedly lower price! Natural rubies can be prohibitively expensive, and they are very often color enhanced by being heat-treated to just below melting point. 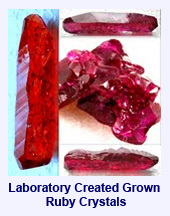 I have laboratory-grown rubies from $25-$195 a carat, depending on quality. Rubies, like diamonds, also have a sorry tale of extreme "flaw-fixing" remedies which include color enhancing and glass injection fracture filling, for cosmetic improvement. When mined, a very high proportion of red or pink rubies are "flawed" by color variations such as purple or black spots. By heating the material to just below the melting point adversely affecting the crystal structure, these undesirable qualities can be removed. However, because of the extraordinarily high temperatures and the difficulty in detecting this occurrence, a stronger interest has been generated for the lab-grown crystal material. 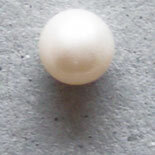 Moon: Pearl increases emotional stability, mental strength, friendliness and contentment. Weakness or afflictions are shown by anxiety, mental and emotional swings, worry, isolation or the inability to cope with relationships and people. An afflicted Mercury or Rahu can also cause some similar difficulties. 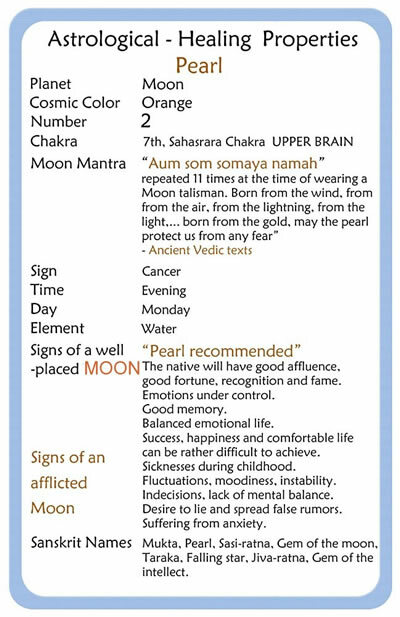 Unless well balanced with other gems, consideration should be taken if the person is overweight, has high phlegm, congestion (Kapha) or for Taurus, Aquarius and Sagittarius Ascendants. 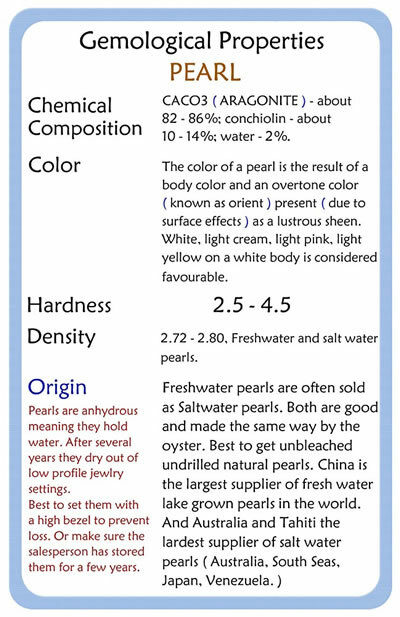 Pearls are especially helpful for Cancer, Pisces and Scorpio Ascendants. 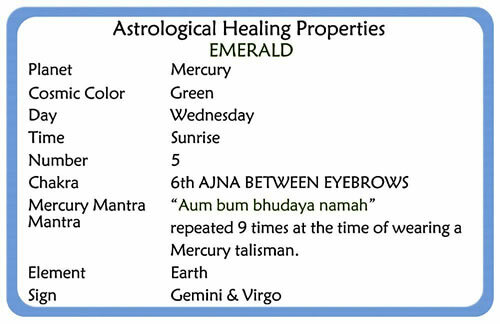 Mercury: Emerald gives mental alertness, memory, communication skills, discriminative intellect and mental control. 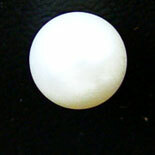 When Mercury is weak or afflicted, a mental dullness, immaturity or poor memory retention may be evident. The logical part of the mind is not functioning in a normal way, which may cause daydreaming, anxiety, fantasies or an irrational outlook on the world. As mentioned, the Moon or Rahu can cause somewhat similar complaints, but Mercury is specifically the planet of intellect and communication. Emerald is generally pretty safe, unless the person is already overly mental. Aries and Scorpio Ascendants may find that it boosts their impulsiveness or egoism. It is especially favorable for Gemini, Virgo, Taurus and Libra Ascendants. Emeralds are also gems of legendary expense, but fortunately can be grown in the laboratory with great results. Lab-grown emeralds are easy to identify because they are usually flawless and of deep green color. Natural emeralds under the microscope show an extensive "garden" of inclusions. 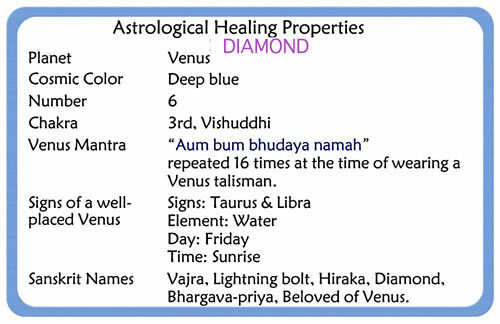 These inclusions can affect the astrological potency of the gem. In the case of emeralds, the depth of green color and uninterrupted amplification of power given off by an unfractured lab-grown crystal is vastly superior to a highly included natural emerald of the same color that would have a carat value (and cost) of at least 40 times the lab-grown crystal. I offer large faceted, deep green lab-grown emeralds for $55 to $75 a carat. It is worth noting that most good quality emeralds have their fractures vacuum acid-cleaned, after which they are heated and pressure-impregnated with a dyed synthetic resin with the same refractive index as the beryl crystal. This process is designed to enhance their appearance and thereby justify an inflated price. In reality it only disguises the gems' heavily flawed condition (but such are the forces that drive the gem market!). Many people who have had their jewelry cleaned were unaware that the sonic cleaners had eradicated the coloring agents in their emeralds and have then sometimes unfairly accused their jewelers of switching stones! 1 This high quality hydrothermally lab-grown hexagonal Emerald crystal has the same geometric atomic structure as a natural emerald. One of the easiest ways to tell a natural emerald apart from its lab-grown cousin is that the natural emerald will have many inclusions. 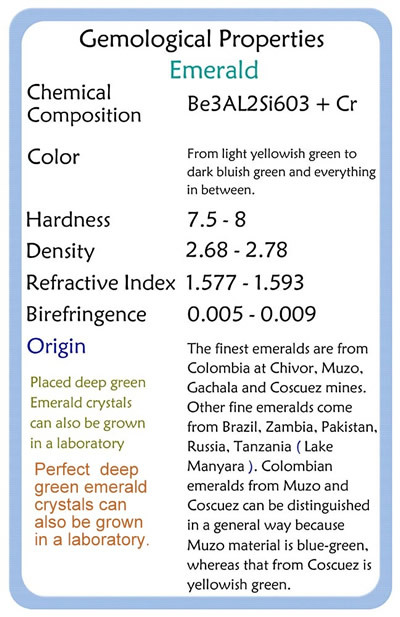 Of course there can also be low grade lab-grown emeralds that are much harder to distinguish from naturals. Emeralds, like quartz, grow in superheated water under extreme pressure, which is why they are called hydrothermal crystals. 2 A raw high-quality hydrothermally lab-grown hexagonal Emerald crystal, grown in a way that results in the atomic lattice being identical to that of a natural emerald made by Mother Nature and the laws of physics. Many people struggle with the concept of a geometrically shaped crystal grown in a controlled environment that imitates nature. But at one fiftieth the price of an untreated natural emerald of the same quality, most individuals simply can't afford a natural emerald of this kind of astrological efficacy. 3 An example of a low quality laboratory-grown Emerald cluster. At first sight almost any gemologist will think this is a cluster grown by Mother Nature, unless they know the lab it came from. 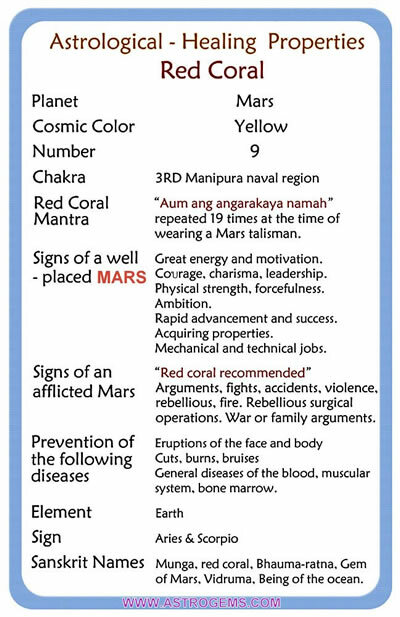 Mars: Red Coral helps stimulate courage, energy, insight and ability to win over opponents. Weakness is shown by lack of motivation, laziness, fear, passiveness, or inability to control their passions and/or temper. Care should be taken in the size of red coral used, if high sexuality, or fever (Pitta) is present. 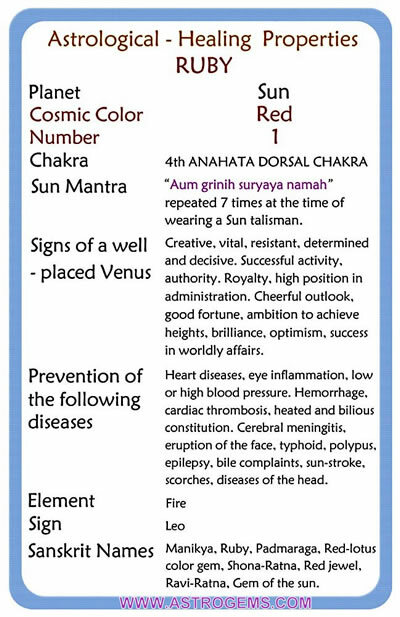 Gemini and Virgo Ascendants should be careful wearing red coral except with counterbalancing gems. 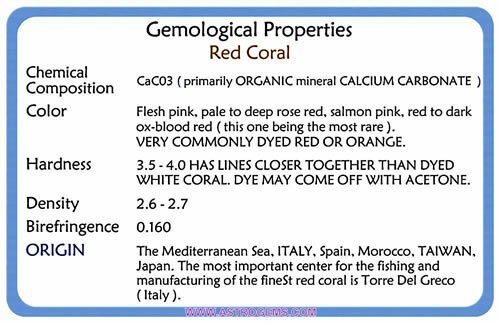 Red coral is especially good for Aries, Scorpio, Cancer and Leo Ascendants. Jupiter: Yellow Sapphire enhances the qualities of Jupiter, such as wisdom, judgment, expansiveness, compassion, joyfulness, enthusiasm and faith. When Jupiter is weak, we feel contracted, without purpose in life, moody, pessimistic or having self pity. There may be financial problems, as generally this planet more than any other, has to do with prosperity. Too strong a Saturn can cause similar complaints. Jupiter is the best benefice and so is safe to strengthen, although it can be a source of some difficulties for Taurus and Libra Ascendants. It is particularly beneficial for Sagittarius, Pisces, Aries and Scorpio Ascendants. This video gives a detailed explanation on why purchasing gems for Navaratna is a very tricky process in a world of enhanced gemstones. Venus: Diamond helps increase attractiveness, artistic quality, grace, and charm. When Venus is afflicted we may feel trapped in a sensuous life style, sexually obsessive, or a creature of comfort. When weak, one may be coarse, crude, or aggressive. There may be troubled or inappropriate romances. It may be difficult to express love or other emotions in a positive way. A very strong Mars may appear to be a weak Venus and a weak or afflicted Mercury may make personal expression difficult. Diamonds, if of good quality, are relatively safe, because Venus is a benefice planet. It is especially good for Taurus, Libra, Capricorn and Aquarius Ascendants. Saturn: Blue Sapphire helps bring balanced detachment, calm, practicality, and endurance. When weak or afflicted, it brings troubles, weakness, disease, vulnerability or anxiety. It can cause financial hardship, lack of drive, or insomnia. A difficult Saturn may cause manifestations similar to a weak Jupiter, Sun or Mars. 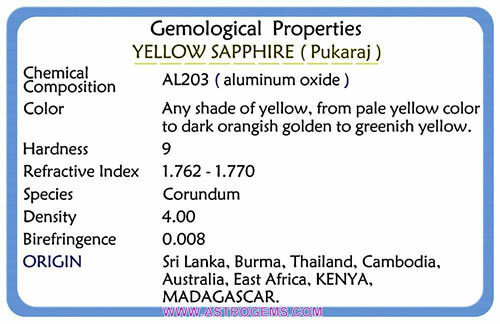 Blue Sapphire should be used with great caution, unless in a navaratna, and even then the size and purity should be watched. It may cause problems for thin people, those having dry skin, or those remote from the world or already overly detached (Vata). It is a difficult planet for most, but is especially favorable for Capricorn, Aquarius, Taurus and Libra Ascendants. Rahu and Ketu are the north and south nodes of the moon. They are invisible energy fields where eclipses occur and are considered secondary planetary influences. Rahu: Hessonite Garnet is the gem for the shadowy planet Rahu, called the North Node in the West. 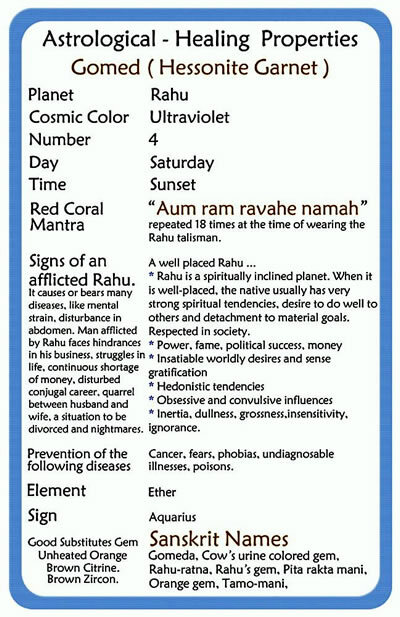 In this age of media, electronic devices and electromagnetic radiation, Rahu is very much affecting the world in general. It helps to balance the influences of media like television, it aids a sense of clarity, of knowing one's own mind, and general popularity in society. When weak or poorly placed, it causes strange reactions, imaginings, occult influences, fear, agitation, addictive behavior, drugs, lack of sense of self, lack of regard for society's norms or dissipation. 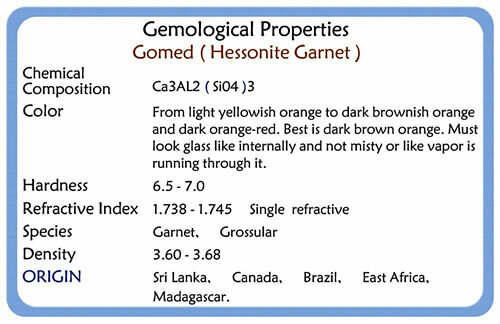 Therefore, Hessonite Garnet, also known in ancient India as cinnabar, is obviously a very good gem to wear in a Navaratna during this age. 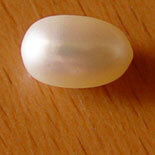 Ketu: Chrysoberyl Cat's Eye is the gem of Ketu, called the South Node in the West. When weak, it causes doubt, uncertainty, poor discrimination, poor concentration or lack of insight. It is the planet of ultimate spiritual awakening. It causes tendencies that appear to be like a weak Ascendant. But as a weak Rahu brings lack of clarity and a clouding of perception, a weak Ketu brings doubt and questioning. 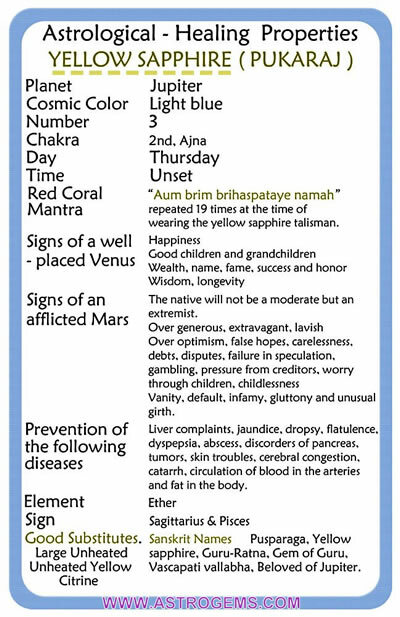 The gem should be used with caution if the person is high in Pitta, as under the description for Mars, or if Ketu is in a sign of a planet that is weak or afflicted. However, if included in a Navaratna, this should be resolved by balancing both Ketu and the planet ruling the sign it falls under. Our Chrysoberyl Cat's Eye Necklaces are about 65 - 70 carats and are beneficial for those who have an issue with Ketu in their chart or are moving into a Ketu Dasha.